Twenty-five years after the dissolution of the Soviet Union, Belarus stands out as a special case in transition blending, on the one hand, signs of relative prosperity, socially oriented policies and sprouts of entrepreneurships and, on the other hand, remnants of the communist past. 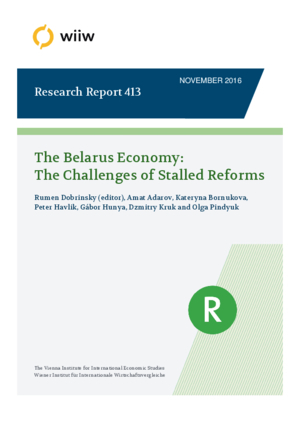 The core of the Belarusian economic model throughout most of this period was a combination of external rents and soft budget constraints on the state-owned part of the economy backed by a strong system of administrative control. In periods of favourable external conditions this mix provided for relatively high rates of economic growth and allowed the authorities to maintain a ‘social contract’ with the population targeting close to full employment. But this model also led to the persistent accumulation of a quasi-fiscal deficit which time and again came to the surface, and its subsequent monetisation provoked macroeconomic and currency turmoil. At present, Belarus’ economic model has run up against its limits and policy changes seem inevitable.